Let’s face it – most drivers have driven around the block searching for that elusive ‘perfect’ parking space. A Charles Sturt University (CSU) research team at CSU in Port Macquarie hopes to take the frustration out of that search by using ‘smart parking’ sensor technology and integrating it with powerful machine learning computer algorithms. 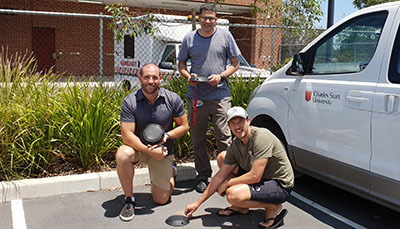 Team leader Dr Sabih Rehman (pictured centre, with team members), the information technology course coordinator with the CSU School of Computing and Mathematics, said 30 per cent of traffic congestion in major cities is caused by drivers searching for parking spaces. “This is an unnecessary and enormous waste of time, fuel and money – plus tons of atmospheric pollution,” Dr Rehman said. “Our project harnesses real-time, parking availability data from parking sensors and predicts future parking availability using machine learning algorithms. Recent graduate from the Master of Information Technology (MIT) and Postgraduate University Medal recipient Mr Jonathan Barker is part of the team. As part of his final-year project for the course, Mr Barker designed and developed a mobile phone application that deploys advanced machine learning algorithms on historical parking data to predict the availability of future parking space. “It’s really exciting to see how accurate the predictions are when you come back and compare them with real-world observations,” Mr Barker said. The project has allowed Mr Barker to explore a range of technologies while completing his postgraduate studies. “It has been an opportunity to stretch myself. I have delved into software programming and machine learning as well as sensor hardware. It draws on multiple disciplines,” he added. Dr Rehman is enthusiastic about the possibilities of smart technology. “The Internet of Things (IoT) revolution is starting to take hold globally, with billions of sensors and devices all connected via the internet. It has the power to solve so many problems,” he said. In the next phase of the project, Dr Rehman and his team will work with CSU’s Division of Faculty Management to see how smart parking technology and machine learning can be used to better manage CSU’s car fleet. For interviews and pictures with Dr Sabih Rehman, who is based at CSU in Port Macquarie, contact CSU Media.